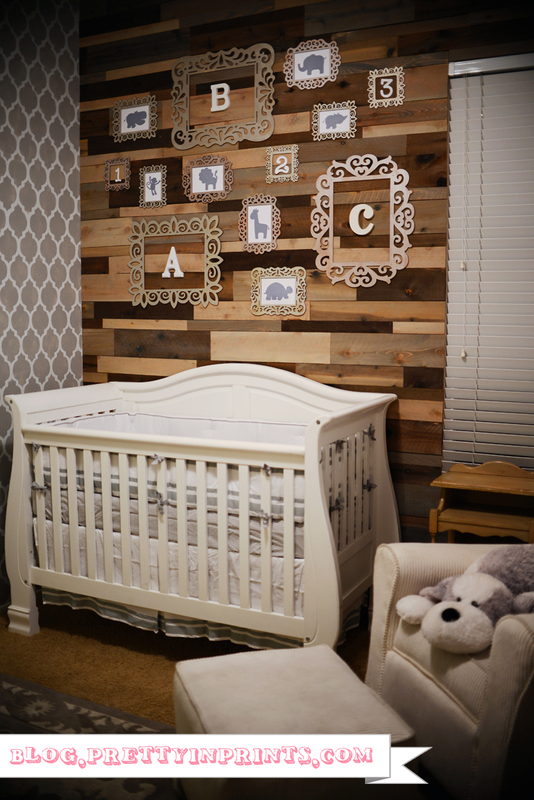 Because we already have a girl’s room full of pink and a boy’s room that is surrounded by blue, we decided to create a gender-neutral space for our 3rd baby, Averey (boy). Although we procrastinated with this (waited until I was 34 weeks to start this project), we ended up spending less than $800 on the entire room (including furniture) and it only took us 6 days to complete! We first started off with the wooden accent wall. 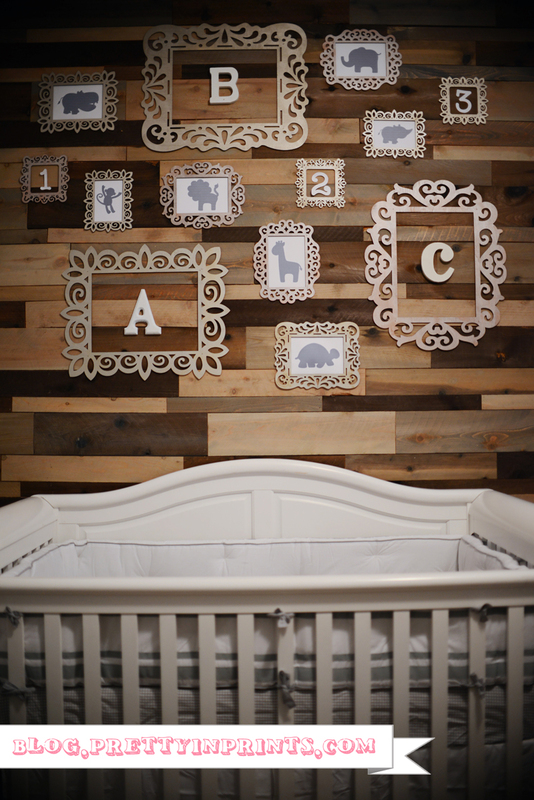 We got a general idea of what to do from this blog except they used old pallets (which they ran into some issues with because of sanding and questioned whether the wood was treated and unsafe for a nursery). We decided to save money and use untreated cedar fence panels and age/stain the wood ourselves. We purchased 30 panels of the fencing, 10 pieces we stained with a gray wood stain, 10 were stained with a dark gray stain and 10 were aged using a solution of a steel wool pad soaked in vinegar (for 12 hours) that we painted on. The vinegar solution gave it a beautiful finish and was faster than we thought. After we cut the pieces to the correct heights (we used 3 different heights), we used a nail gun and nailed directly into the walls (as opposed to using plywood first). I marked studs, but we didn’t always hit the studs. We tested the strength of the nails into the drywall and they were pretty secure as is. 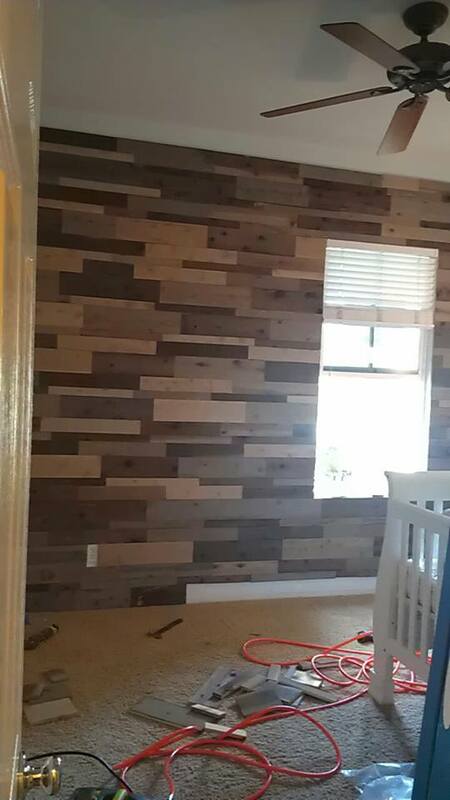 The entire wall only took 3 hours and the cost of the wood was $60. As for the crib, I didn’t want my husband spending so much time sanding down each individual crib slat so I decided to just purchased a used crib on Craigslist. We got ours for $80. We had saved our crib and changing table/dresser that we used with our first two children, but it was a honey oak color that just didn’t go with our decor. 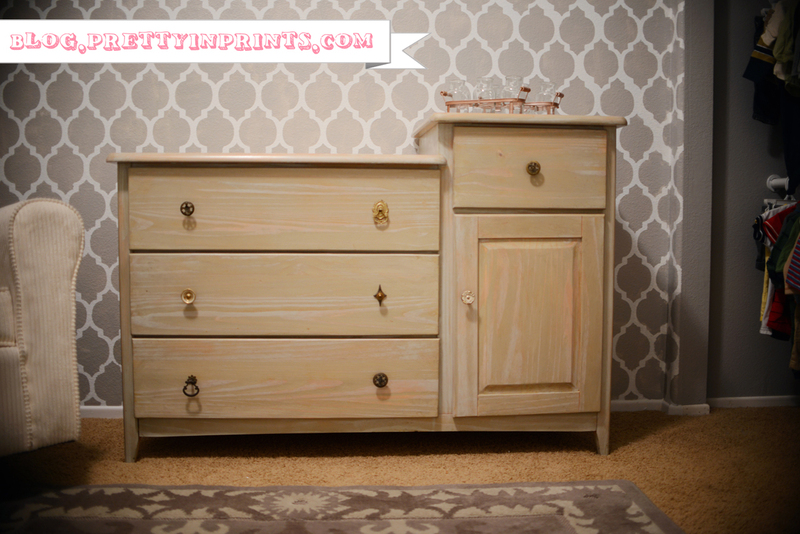 Since it was solid wood, my husband was nice enough to refinish the changing table/dresser in a same light gray stain that we used on the wall panels. I went searching at some antique stores for old drawer pulls and was able to buy different ones for about $3/each. I even had two more to use for the closet drawer unit. For the rest of the walls, I purchased the Casablanca Allover Stencil from Cutting Edge Stencils and used Behr paint in #790E-3 (Porpoise) in semi-gloss (we primed the walls in white first). The walls took the longest because it was difficult keeping the stencil level (you really HAVE to use a level to make sure everything is aligned or you’ll end up spending more time fixing your mistakes). It was also so difficult to stencil the corners and edges, and near the end of my 18 hours, I started using a large plastic putty knife to hold down the stencil so I could do the edges and corners. The walls took me 18 hours (2 days), but only used about a half a gallon of paint. The next big project was the closet. I knew from 2 previous children that we needed way more hanging space than just 1 rod and we also needed some storage space. 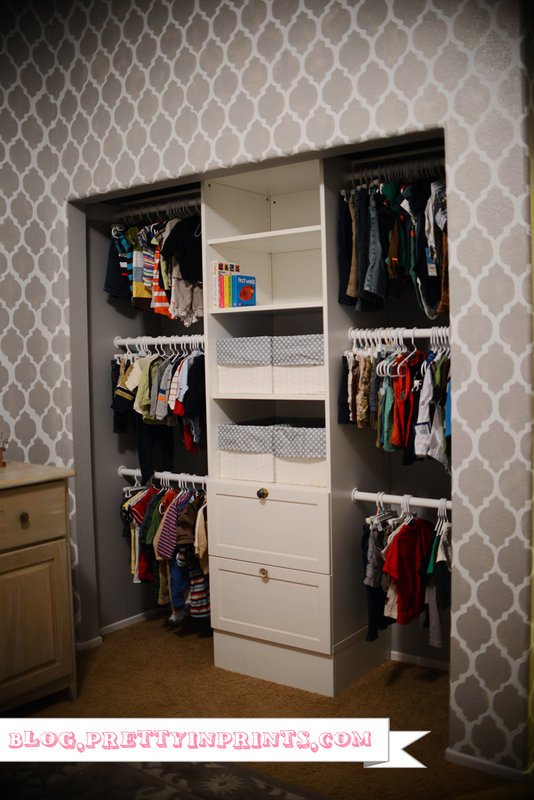 After researching Pinterest, We decided on using 3 rods on each side with the storage unit in the middle (if needed, we could always move the rods up and down). First we removed the closet doors, shelf, rod, and then the framing of the closet and had to repair holes and the bottom baseboard that had a gap. Then we painted with the leftover porpoise gray paint. We were planning on building in the middle shelf unit ourselves, but I was really tired of painting and didn’t want to have to finish the unit, so we ended up purchasing the base unit of the STUVA storage system from Ikea (along with 2 large drawers and a couple of shelves). My husband built up a base (about 6 inches high) so that the shelf unit reached the top of the closet opening. We placed the rods as high up as we could, with 25” in between (and the bottom rod up off the floor about 30”). The shelf unit with the pre-painted rods cost us about $180. The frame collage wasn’t what I originally wanted. I had vintage looking resin frames that I collected and wanted to hang, but when we went to Michael’s looking for baskets for the closet, we found these laser-cut wooden frames on clearance and decided to use these instead (they’re lighter to hang and safer if they were to fall). With a little bit of metallic spray paint, some animal silhouette pictures that I printed from the computer, and a couple of wooden letters, we made this collage for around $40. Our splurge on the room was definitely the crib bedding because I couldn’t find a cheap crib set with such a streamline look. I ended up purchasing the Harper Crib Bumper and Crib Skirt from Pottery Barn Kids and various gray/white crib sheeting (dots, chevron, elephant patterned) from Target. Oh, and my husband found the rug on clearance at Lowe’s for $60. Not quite the pattern that I wanted, but WAY better than spending $500 on a same size rug from Pottery Barn Kids. The room is still unfinished. We’re going to make a couple of various sized crates with the cedar wood fencing that will hang above the changing table dresser (to be used as shelves/storage). I still need to make a roman shade for the window, and I’ll be on the lookout for something cool to hang behind the glider (like an old lantern or something). Can you tell me where you got the wall paper for the room?